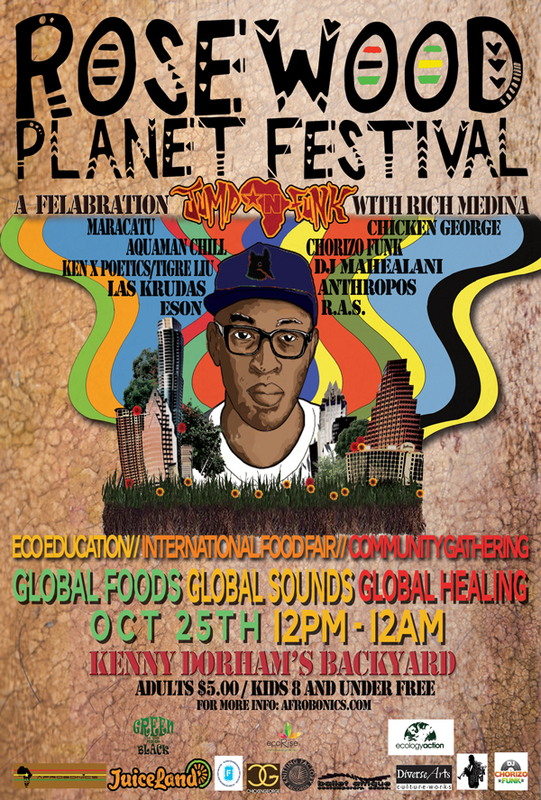 Please join us on October 25th for the Rosewood Planet Festival, an all-day multicultural celebration of music, global cuisine, and environmental awareness! This event, taking place outdoors at neighborhood favorite Kenny Dorham's Backyard, features green sector organizations and companies who will offer information about their products and promote eco-consciousness. Headlined by celebrated DJ Rich Medina, the Rosewood Planet Festival will showcase music from artists including local favorite DJ Chorizo Funk, Deejay ChickenGeorge, husband-and-wife hip-hop outfit Riders Against the Storm, dub-roots-reggae fusion from DUB Gideon, Las Krudas, Aquaman Chill, Maracatu, hard-rockers Anthropos, Ken X, and dance by Ballet Afrique. In addition to this stellar musical lineup, the festival will offer a delicious variety of global cuisine, including Jamaican, Brazilian, African, Greek, Cuban cuisine, and more! Admission to the Rosewood Planet Festival is $5.00 for adults, and kids age 8 and below get in free! For more information, visit afrobonics.com or contact DiverseArts Culture Works at diversearts.org.